The Chevrolet Malibu (named after Malibu, California) is a mid-size car produced in the United States by General Motors. It is marketed in the United States, Canada, Mexico, Brazil and the Middle East. The first Malibu was a top-line subseries of the mid-sized Chevrolet Chevelle from 1964 to 1972. Malibus were generally available in a full-range of bodystyles including a four-door sedan, two-door Sport Coupe hardtop, convertible and two-seat station wagon. Malibu offers a choice of four-cylinder and V6 engines. 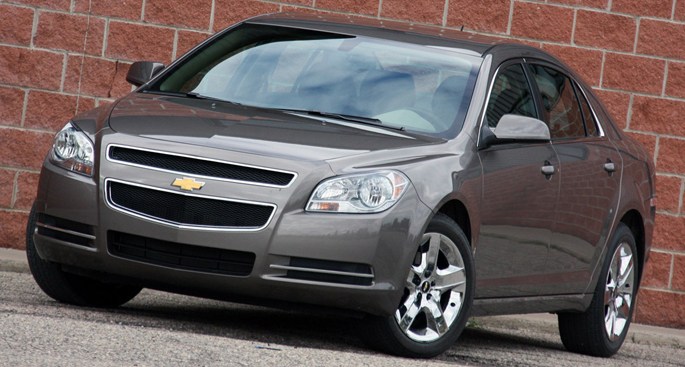 A new fuel-saving 6-speed automatic transmission with TAPShift manual control is standard on all 2011 Malibu models. OnStar 9.0, the latest version with improved voice recognition, comes standard with six months of Directions and Connections service with Turn-by-Turn Navigation. 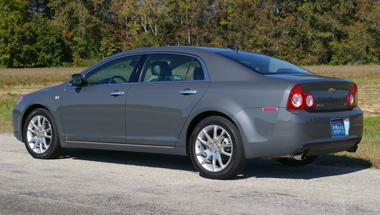 Other upgrades for 2011 Malibu models include 17-inch bright aluminum wheels on the Malibu 1LT, and 18-inch Chrome Tech aluminum wheels for the Malibu 2LT V6. 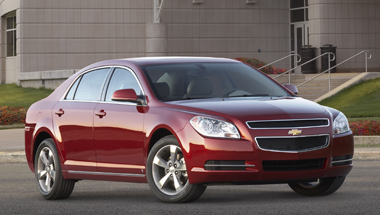 Malibu offers value, with a good fuel economy. The first car interiors were more lavish than lesser Chevelle 300 and 300 Deluxe models thanks to patterned cloth and vinyl upholstery (all-vinyl in convertibles and station wagons), deep-twist carpeting, deluxe steering wheel and other items. The Malibu SS was available only as a two-door Sport Coupe hardtop or convertible and added bucket seats, center console (with optional four-speed manual or Powerglide transmissions), engine gauges and special wheelcovers, and offered with any six-cylinder or V8 engine offered in other Chevelles - with the top option being a 300 horsepower in 1964. First generation Malibus and other Chevelles received new car grilles and revised tail sections and had the exhaust pipes replaced but carried over the same basic styling and bodystyles from 1964. The Malibu and Malibu SS models continued as before with the SS featuring a blacked-out grille and special wheelcovers. The most noticeable interior feature of the Malibu is the dual-cowl dashboard and instrument panel layout inspired by vintage Corvettes. This design is brought into the 21st century with wood and metallic trim and a pleasing blue-on-white instrumentation graphic treatment flooded with blue light at night. Cloth, faux-suede and leather interior options are available. The standard interiors are monotone, but several two-tone interior combinations are available, including a dramatic black-and-saddle leather combination that's very attractive. The leather seats in the Malibu are quite comfortable. The front bucket seats are very supportive.While the trunk has 15.1 cubic feet of cargo volume, the stylish rear pillars are pushed to the far back of the car, creating a small trunk opening that won't accept large boxes. The quality of the interior materials is good. It doesn't bowl you over, nor does it reek of cheap plastic. Every Malibu comes with interesting Chevy Malibu Accessories, satellite radio and the latest version of OnStar with Turn-by-Turn navigation. However, there's no GPS navigation system, nor is there a back-up camera. Chevrolet says many people prefer to use their portable GPS units and relatively few want to pay for an OEM navigation system. Big knobs and buttons and an elegant design make operating the audio and climate functions easy. The Malibu has the audio controls at the top, which is better because people tend to fiddle with sound systems more than temperature controls.